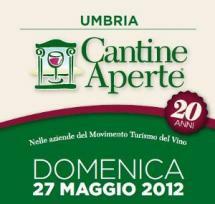 The countdown to the 2012 edition of Cantine Aperte (Open Cellars) is already underway, and will be its 20th birthday. The event, organized by the Movimento Turismo del Vino dell'Umbria (Wine Tourism Movement of Umbria), calls wine tourists to spend the last Sunday of May in the cellars belonging to the Association, to know and better appreciate the infinite qualities that wine, especially the Umbrian, hides. It will then be two days, May 26th and May 27th, 2012, dedicated to good wine but also the good food: in fact, on May 26th, 2012, you can enjoy excellent dishes with "A Tavola con il Vignaiolo" ("At Table with the vine-dresser"). Reservations required. For the list of the participating wineries and companies we refer to the .Pdf file at the bottom of the page. The May 27th, 2012 instead will be the day of the wine tastings in the cellars, the real 2012 Open Cellars. But not only: the cellars, in fact, combine tastings with tours, folklorists events and shows how can be concerts and exhibitions. Open Cellars again this year working with the Comitato per la vita Daniele Chianelli with "Un bicchiere per la Vita" ("A glass for Life"). Absolute novelty will be the initiative "Uno scatto per 20" ("One click for 20") that makes it possible, for groups of 20 people who will take photos in memory of the day, to participate in the contest to win a voucher for a trip wine-themed in Umbria, valid throughout 2012.